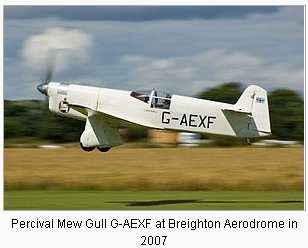 In early October 2013 Bryan L spotted that the Shuttleworth Collection had aquired Percival Mew Gull G-AEXF. Click for the details. At the beginning November the Shuttleworth web page was still saying "The success of this design culminated in the aeroplane winning the coveted Kings Cup Air Race in 1938 flown by Alex Henshaw. The race covered a remarkable distance of 12,754 miles, from England to Cape Town and back, and broke many records including the fastest time ever recorded by a British light aircraft in 1939." Bryan said in October "This was news to me as the King's Cup race was around Britain. I have pointed the error out to the media people at Old Warden." He also swapped e-mails on the subject. Bernie came back with a link to the South African Power Flying Association where the journey from London to Cape Town in 1936 was regarded as a race. However NOT the King's Cup Air Race and offered this link to Wikipedia for further details. Here the Kings Cup race for 1938, which finished at Hatfield with a distance of 1102 miles, was won by G-AEXF, flown by Alex Henshaw. The record breaking Cape Town trip was made in 1939. Brian W then said "Do I remember Shuttleworth owning the Mew Gull before? " Wikipedia in the "Type History" section of its page on the Percival Mew Gull does list this previous ownership. Bryan L passed on a Wikipedia link to Alex Henshaw, who, incidentally, was born in Peterborough, where nothing was mentioned about the 1939 trip to Capetown being a "race". Bryan L also said that the Henshaw book "The Flight of the Mew Gull" is recomended. Jonathan said that he had Alex Henshaw's book and would also recommend it. 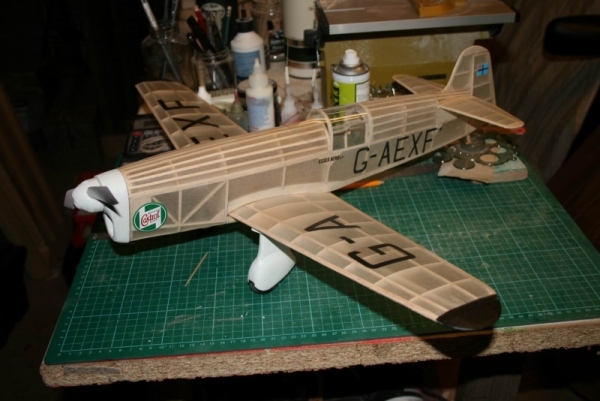 Also "It's interesting to note that Alex Henshaw's Mew Gull was heavily modified from the original Mew design by Jack Cross of Essex Aero. In fact AH beat Fred Percival in his own Mew in one air race! As far as I know Shuttleworth never owned AEXF but it was based there under the ownership of Desmond Penrose. There is a section on it in John Dibbs' photographic essay from this period. I have a friend who knows a someone who is building a full size replica Mew in his garage down Cambridge way - close to flight testing apparently! Shuttleworth did own a Gull Six at one point - Jean Battens ADPR - which was then sold on to New Zealand where it's a (sadly) static display in an airport. I have a dime scale model of this one on my (long) to do list. Henshaw's Cape record still stands by the way." "From Wilikpedia. The Cape record stood for more than 70 years. On 11 May 2009, Charles Stobbart set a new record ratified by the FAI for the reverse route, Cape Town - London - Cape Town. Subsequently, on 3 September 2010, Steve Noujaim, http://www.capechallenge.com/noujaim.php flying a homebuilt Vans RV7, landed at Southend Airport in the UK after completing a round-trip to Cape Town in 3 days, 11 hours and 16 minutes. The new record bettered Henshaw's time by almost a day. An attempt to fly the route with just one stop by Tony 'Taff' Smith http://cape-run.realaero.com/flight_diary.html"
John Dibbs' photographic essay are available on the web. Not sure that cigarette cards add anything to the above but I have always liked the "style" of these 1930's drawings, with Players winning on quality over Godfrey Phillips.